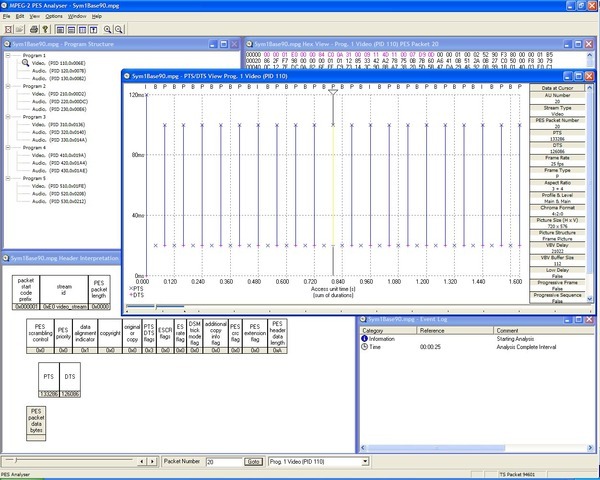 The MTS4SAV3 Transport Stream Analyzer is a new class of analysis tool, the world’s first compressed digital video debugger/analyzer that includes Tektronix CaptureVu® technology, a capability that captures and analyzes system events in real time to debug the intermittent and complex problems that traditional analyzers miss. 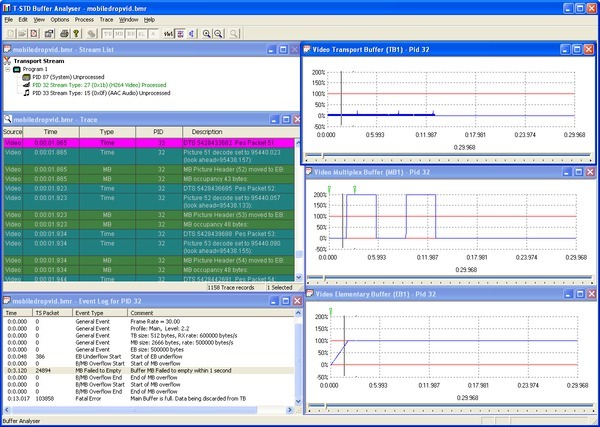 The MTS4SAV3 Transport Stream Analyzer offers significant enhancements over traditional software-based MPEG analyzers when operating in deferred time (stored streams). The combination of an innovative high-speed analysis engine and built-in intelligence allows ultra-fast pinpointing and debugging of intermittent faults in MPEG Transport Streams. The MTS4SAV3 also introduces real-time Video over IP analysis and recording with the users' own Microsoft Windows PCs equipped with a standard 10/100 or Gigabit Ethernet Network Interface Card (NIC). Tektronix industry leadership offers the broadest (across multiple standards and video layers) and deepest (in-depth of generation and analysis) solution for compressed video test. The MTS4SAV3 standalone software can be applied anywhere at any level, to diagnose and solve the most subtle, complex, and intermittent DTV problems in the minimum time. 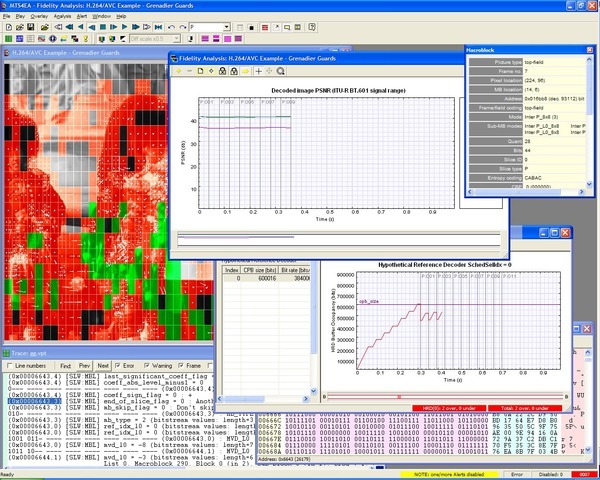 The MTS4SAV3 provides a comprehensive suite of analysis tools including Transport Stream (TS) compliance, buffer, PES, compressed video and audio Elementary Stream analyzers, together with TS Editor, Multiplexer, and Data Broadcast applications for stream creation, analysis, and error injection. 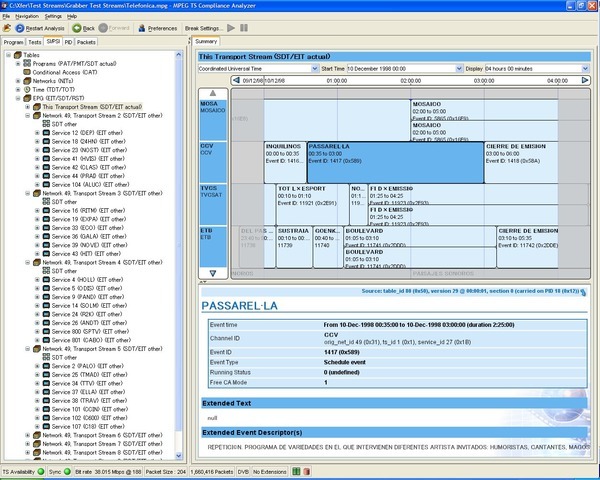 The TSCA software can be purchased to run stand-alone on computers with the Microsoft Windows 7 or Windows 8.1, 64-bit operating system. Separate packages are available for Deferred-time Analysis and Real-time Video over IP Analysis. 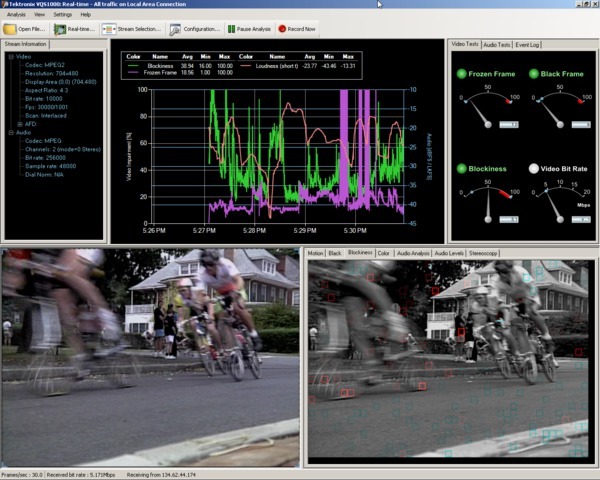 Both packages offer CaptureVu® technology plus IP and TS measurement, logging, and graphing capabilities. The TSCA can be run in deferred-time or real-time for analysis of compressed video streams carried over an IP interface. 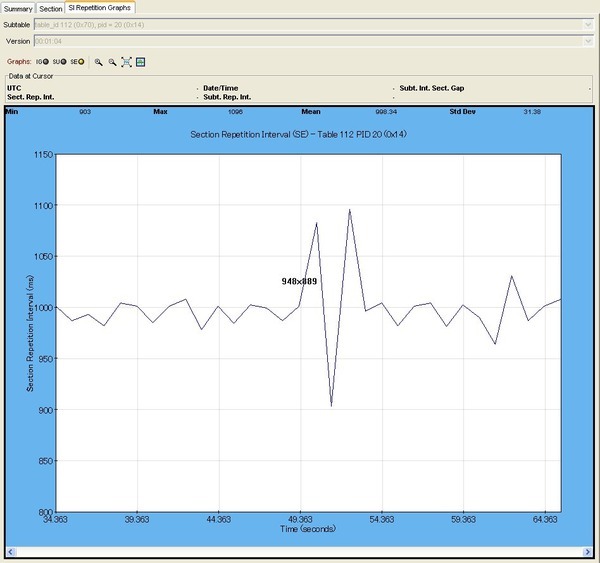 Deferred-time analysis mode enables a stored stream to be analyzed and viewed at any time and is available on any recommended platform. CaptureVu® technology captures and analyzes system events in real time and deferred time to debug the intermittent and complex problems that traditional analyzers miss. 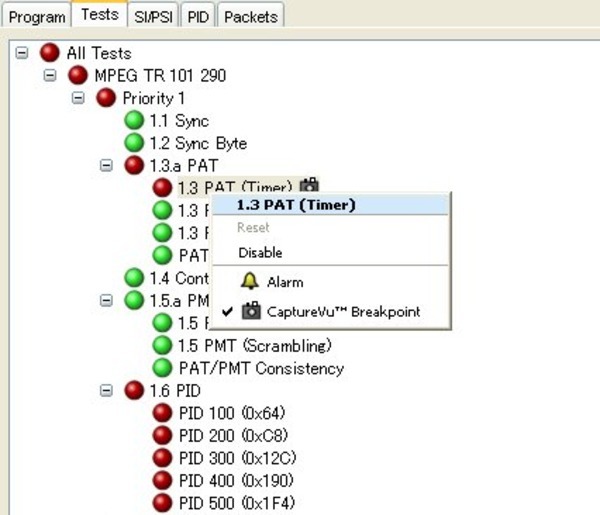 CaptureVu® technology lets the user set a breakpoint on a specific test or event and, when the breakpoint occurs, a dialog will show the breakpoint condition and exact location of the packet within the Transport Stream. CaptureVu® technology automatically prebuffers the last 200 MB of the signal, pauses the analysis, and launches an in-depth deferred-time analysis that lets the user drill down into the problem. The captured stream can also be permanently stored on the hard disk for subsequent reanalysis with the deferred-time TSCA application. 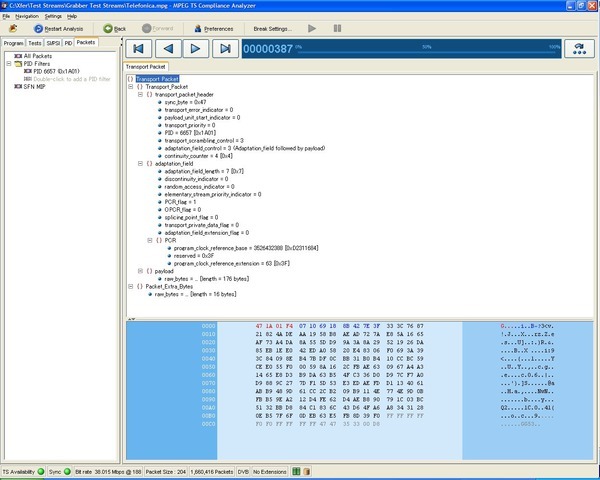 This powerful debug mode enables fast debugging of troublesome intermittent problems. 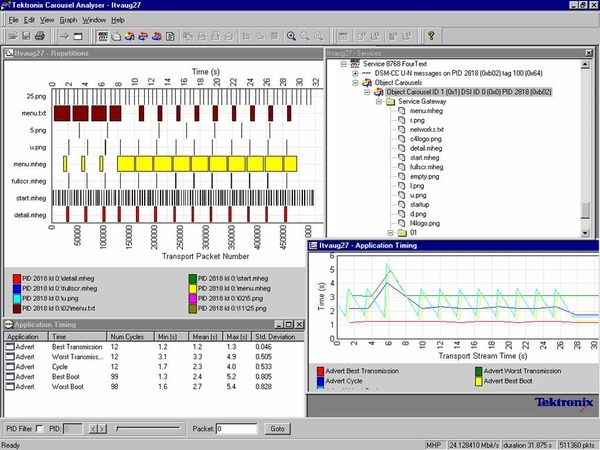 CaptureVu® technology also supports triggering events based upon IP Layer measurements providing integrated cross-layer fault analysis and logging in a single box solution for network fault diagnosis. 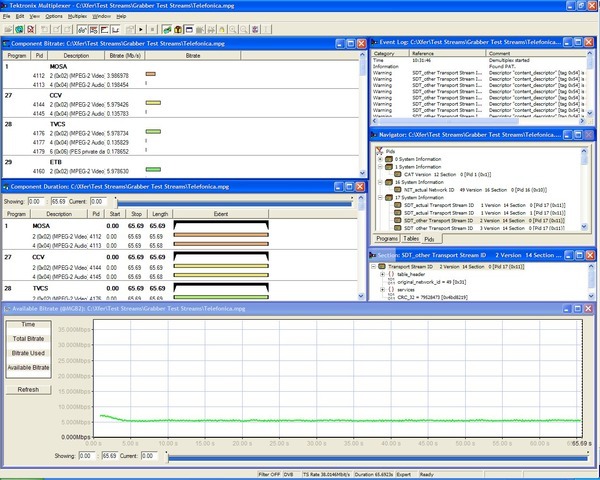 The SI/PSI and PSIP tables view displays the service information tables contained in the analyzed stream which comply with the selected digital video standard. This includes ATSC PSIP, DVB, and ISDB service information and MPEG program-specific information. A summary view displays key values for each table in a meaningful way. The view includes hyperlinks enabling you to quickly access related information within other tables and views. 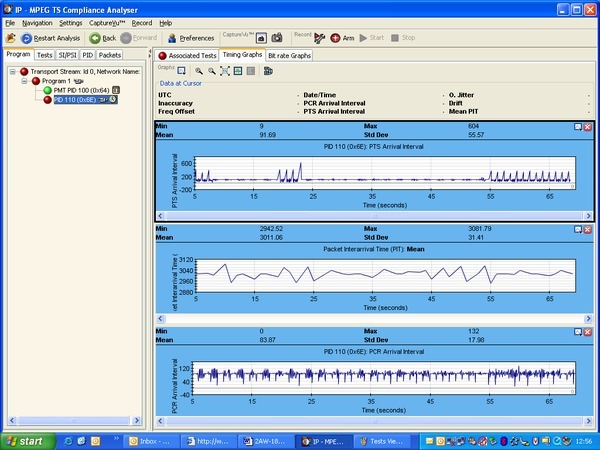 PCR graphs are available in real time and deferred time. Time stamping data makes sure that these can be captured and viewed on stream recordings. 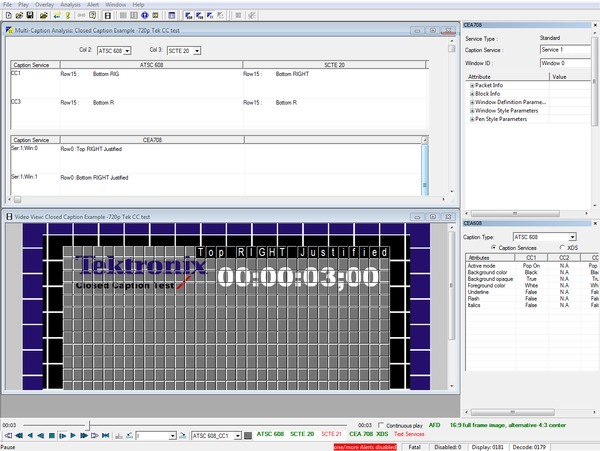 This time stamp is compatible with recordings from other Tektronix equipment including the MTM400 and MTM400A Transport Stream Monitors. Selectable MGF filters provide maximum flexibility and compatibility in these important PCR measurements. The TSCA is also able to display PTS Arrival Interval graphing in real time or deferred time, and includes PTS-PCR and DTS-PCR graphs to detect possible Receiver buffer under- and overflow problems. 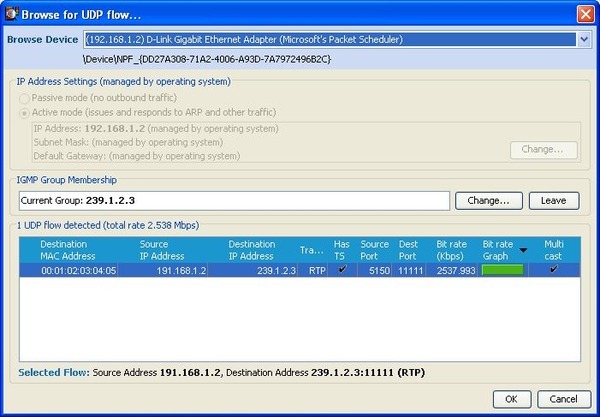 1Network traffic loading is specified to 600 Mb/s maximum bit rate. H.265 (HEVC) and H.264 Elementary Streams can also be multiplexed into a Transport Stream. This enables the user to create their own test streams that they can use to validate and debug their designs more quickly, and also to create errored streams to perform parametric stress testing and ensure the robustness and quality of their MPEG-2, MPEG-4 (AVC) or HEVC (H.265) implementation. 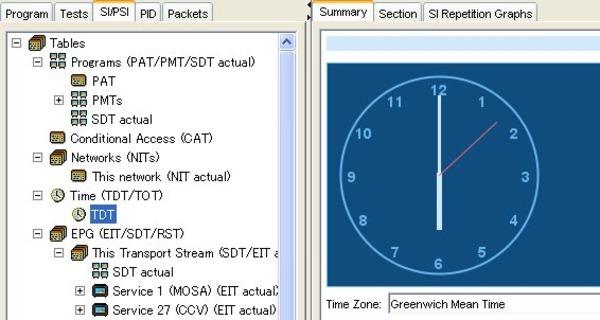 When looping a Transport Stream to simulate continuous playout, errors can be generated at the loop point caused by discontinuities in timing information. The Make Seamless wizard provides the opportunity of creating a seamless version of a Transport Stream file by adjusting SI and ES components within the stream. There are two types of buffer model. The one to use by the receiver is signaled within the Elementary Stream itself. The T-STD method is based upon the DTS values within the PES header and can be used for any contained codec type. Additionally, certain video codecs such as MPEG-2, MPEG-4 (AVC) or HEVC (H.265) may contain buffer parameters within the ES itself. 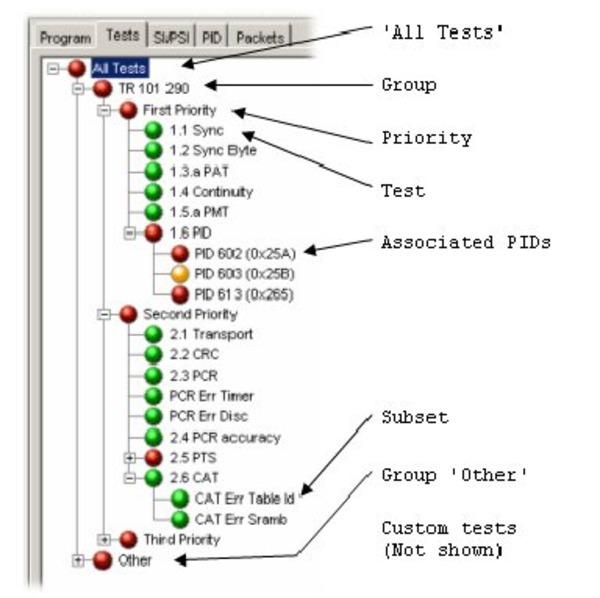 The Buffer Analyzer verifies conformance of a stream to the T-STD model. Verification of the H.264/AVC HRD method is covered by the MTS4EA product. When developing professional and consumer equipment, particularly encoders and set-top boxes, the characteristics of the test streams being either generated or used as stimulus need to be ascertained. The header associated with each PES packet is of particular interest, as it contains the decode and presentation time stamps (DTS and PTS) for the contained Elementary Stream. Errors in these time stamps may cause resets or picture freeze problems at the receiver in extreme cases. They are more typically the cause of lip sync problems where the time stamps of associated video and audio streams are not synchronized. The PES Analyzer is designed to help address these problems and verify conformance of the PES header contents to the MPEG, DVB, and ATSC standards. Packetized Elementary Stream (PES) Analyzer. Whether developing a new codec chip, integrating a codec into professional or consumer equipment, or integrating different vendor’s equipment when rolling out new services, the ability to verify the compliance of an Elementary Stream is crucial. This tool checks for compliance of an Elementary Stream to either next-generation VC-1, HEVC/H.⁠265, AVC/H.⁠264, and MPEG-4 standards, or legacy MPEG-2 and H.⁠263. Audio decode and waveform display of MPEG-2 audio (ISO/IEC 13818 parts 3 and 7), AC-3, and MPEG-4 AAC are also supported. Comprehensive diagnostic capabilities including semantic trace view to determine Frame-by-Frame and Block-by-Block encoder decision making. 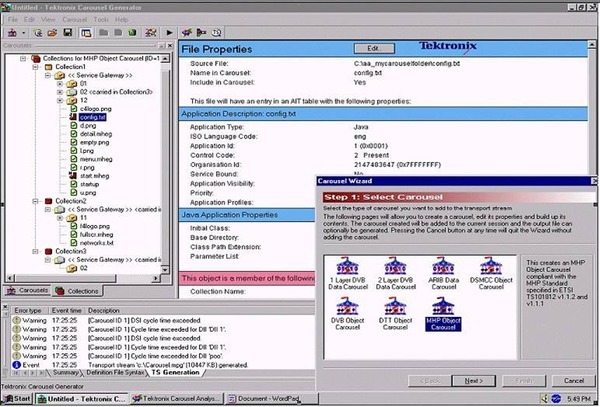 Synchronized displays allow the user to quickly ascertain the details of each reported error. 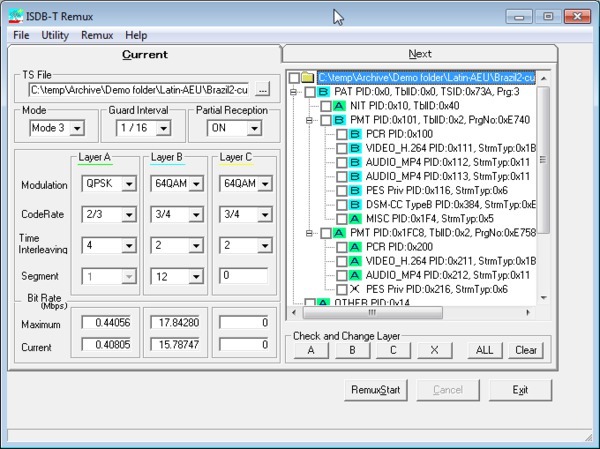 A bitstream editor allows the effects of planned encoder updates to be quickly understood. The MTS4EAV7 Closed Caption analyzer is intended for Closed Caption compliance testing and for debugging Closed Caption problems when captions do not appear over video. The analyzer allows you to extract the captions to SCC, MCC and SRT files and provides the ability to render captions over video and to align the CEA608, CEA708 and SCTE 20/21 control commands along side the video. MPEG-2 and AVC video with TS and MXF containers are supported. 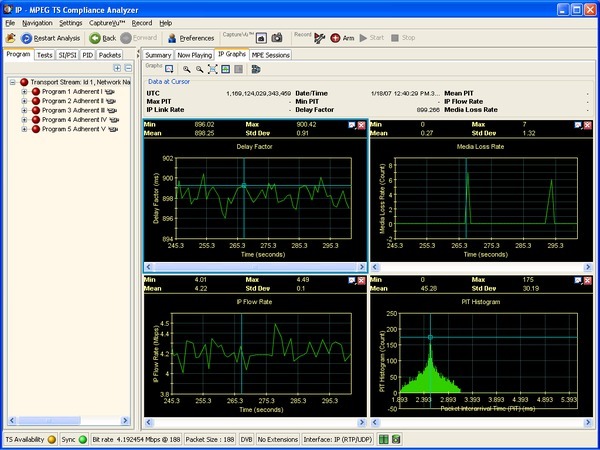 The ES Analyzer is intended for codec design, optimization, and conformance purposes. It provides the ability to view the moving picture from within a PES stream and carry out a whole range of sophisticated tests on the lower layers of an Elementary Stream within a Transport Stream. In addition, it both analyzes and displays a range of extended media formats, including ATSC Closed Captions, DVB Subtitles, and Teletext associated with video Elementary Streams. For analysis of MPEG-4, HEVC/H.265, AVC/H.264, and VC-1 and MPEG-2 Elementary Streams, please refer to the MTS4EAV7 HEVC/AVC ES Analyzer. The Carousel Generator is used for creating object carousel contents within an output Transport Stream. This is particularly useful in test situations where the effects of varying parameters, such as individual repetition intervals, may be quickly ascertained. The generator will create object carousels conforming to the MPEG-2 DSM-CC, DVB, DTT (MHEG-5), or MHP standards. The ISDB-T Remux application shows each of the transport stream PIDs being dedicated to Layers A, B, or C. The remultiplexed .RMX file can be played over ASI to a ISDB-T/Tb modulator. VQS1000 video quality software enables QoE monitoring capabilities and real-time assessment of video impairments on MPEG-2 or H.264 encoded content, including stuck, black, blockiness, and compression artifacts for selected services. The VQS1000 performs a full decode on the video stream that allows operators to determine the source of a problem (content source, network distribution, etc.). Engineers can clearly see and validate the presence of impairments on the image using unique impairment displays that highlight the location and severity of video defects. In addition, audio diagnostics allow operators to analyze audio loudness related problems to the ITU-R BS.1770/1771 audio loudness standard. PQASW is picture quality analysis software based on the concepts of the human vision system which provides repeatable, objective quality measurements that closely correspond with subjective human visual assessment. These measurements provide valuable information to engineers working to optimize video compression and recovery, and maintain a level of common carrier and distribution transmission service to clients and viewers. The IP interface enables both generation and capture of compressed video with two modes of simultaneous operation. Simultaneous generation and capture lets the user playout the reference video clips directly from an IP port in the PC into the device under test. The test output from the device can then be simultaneously captured by the PC. This saves the user from having to use an external video source to apply any required video input to the device under test. With this generation capability, files created by video editing software can be directly used as reference and test sequences for picture quality measurements. Use the Multiplexer/Remultiplexer/Demultiplexer application to create multiprogram Transport Streams with custom SI/PSI/PSIP information for DVB, ATSC, ISDB, and MPEG compliant Transport Streams (see details below). One or more MPEG Player applications can be open to stream TS file over the PC NIC. Additional features include address/port replication, dropped TS packets, error insertion, and IP packet jitter creation. 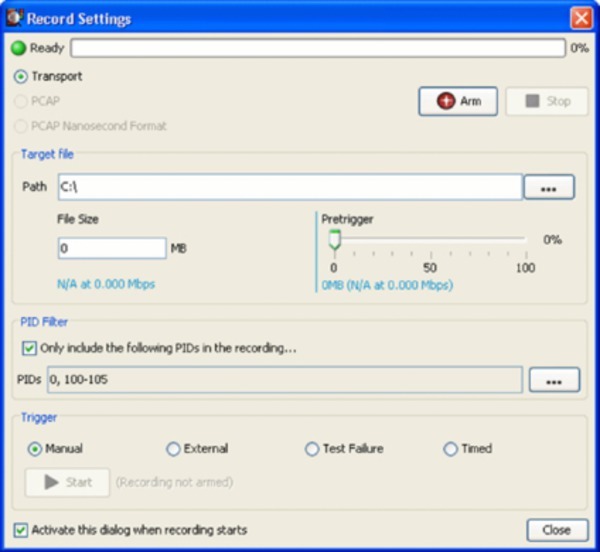 MPEG Transport Stream Analyzer standalone software, requires appropriate options to enable. At least one of the following options must be ordered. Upgrade options for existing MTS4SAV3 or MTS4SA software.